A few months ago, Hefty released a new line of products called the Hefty Serve 'n Store tableware. There's nothing revolutionary about a set of plastic plates or microwavable storage containers - but the Hefty Serve 'n Store is definitely a clever improvement over its parents: the plastic disposable plates and the low-cost multi-use disposable plastic container. Each plate interlocks with another plate of the same design to form a resealable container. We tried them in our daily lives (and under some contrived tests) and they performed admirably. Pactiv Corporation manufactures the Hefty Serve 'n Store tableware in two varieties: Everyday Tableware and Party Tableware. The Everyday variant is white plastic with a matte finish that is supposed to be sturdy, easy to grip, and microwavable. The Party variant, as far as I can tell, is just a brightly colored version (available in red and blue) of the Everyday tableware. I tested the Everyday variant. The plates worked as advertised. The rims are ridged in such a way as to allow two plates of the same size to interlock together to form a storage container. The idea is to use the same plates you would use to serve food (or eat off of) to double as storage containers. Tina and I are big fans (or at least we use them a lot) of Ziploc brand food storage containers. They are low cost, convenient, and work great as lunch containers to take to work. But, a lot of the time, stuff doesn't fit conveniently in them, pizza slices, sausages, chicken marsala, etc. Plate-sized storage containers make storage of most meals fast and easy. 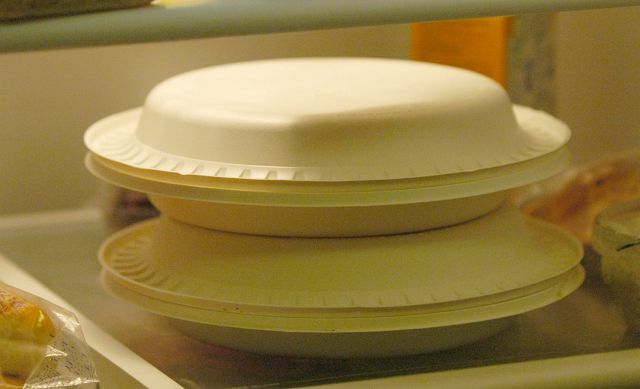 Microwaving food in the plates was also convenient. I simply popped the top plate off and repositioned it so the interlocking tabs sat on top of each other, opening up a bunch of vents to allow steam to escape. Reheating occurred quickly and evenly since the contents of the plate were spread out without having too much content stacked on top of each other (a common problem I have when reheating lunches that I pack for work). The general feel of the plate reminded me of thick, heavy duty paper plates. The plastic has a matte finish that feels like you're holding paper, not plastic. It's also stiff and doesn't flex easily. Several other testers commented on how much the Hefty Serve 'n Store plates felt like a paper plate. One tester was so convinced the plates contained some paper that he didn't want "to take a chance with soaking the plate" for fear that it would rip or tear. As expected, the plates hold liquid without any sign of soaking (they are plastic after all). We also hand washed the plates which cleaned up easily and nicely. I received some information from Pactiv when I called to ask about washing the plates. Since the plates are designed to be disposable, there will most likely be some reduced performance in the interlock mechanism of the plates (i.e. they won't fit together as well) with repeated washing. Washing in a dishwashing machine is not recommended due to the high temperatures that a dishwasher reaches. I should also mention that the seal made by the interlocking plates is not water tight, but works pretty well to prevent liquid from escaping if it sloshes around a bit. Just don't fill it with soup and then tilt it. I brought over a stack of plates to a friend's place, and we grilled up a couple dozen burgers and sausages. Service was handled by the plates and they worked flawlessly. Most of the testers ate standing up holding their plate with one hand and accessing their food with the other. None of the plates bent or flexed under weight and the plates were deep enough to hold corn on the cob without the eater worrying about the corn rolling off the plate. The rims of the plates were both stiff and comfortable making the plates easy to hold. We then served up Korean BBQ short ribs and some of the testers used a metal knife to cut the short ribs. The plate held up to the cutting just fine. It seemed that the plates worked at least as well as other heavy duty plates from such companies as Chinet or Dixie. At this point, we tested the crux of the Hefty Serve 'n Store usage model: storage of leftovers. We took combined the leftovers from the plates we used for serving onto a couple plates and used the newly emptied plates to cover. At first we tried to shove too much food onto one plate, but the lid wouldn't close. After distributing a reasonable quantity of food onto the plate, the other lid snapped into place without a problem. After enclosing all the leftovers in the interlocking plates, they stacked on top of each other and went into a bag for easy transport back home to my refrigerator. We only had two "issues" with the interlocking plates. First, since the plates are opaque, we can't see what's stored in each container. Second, there is no physical mechanism that helps each pair of plates from slipping off each other when stacked (although the plates have a bumpy matte finish that increases friction). When we first heard about the plates, we thought, "Why can't we just use plastic wrap to seal the plates? Is it really necessary to use another plate to cover your leftovers?" Well, usually plastic wrap doesn't stick or seal well when used on paper or plastic disposable plates, so you have to wrap all the way around so the plastic will stick to itself. Also, once the plate has been wrapped, stacking plates doesn't work too well when the only thing separating the bottom of your top plate from the bottom plate's content is a thin sheet of plastic. The interlocking plates solved the problem for us and we efficiently stacked the leftovers without worrying about tilting plates or ill-fitting plastic wrap. After using the Hefty Serve 'n Store tableware for a couple weeks, we are convinced that the product lives up to its advertised promises - plus they're quite convenient and the plates are high quality for the price ($2 for a 24 pack of 9-in. plates). Also, the bowls interlock with the 9-in. plates to form deep dish storage containers. The plastic is solid and has a nice textured feel (as opposed to other brands with thin flimsy plastic that might not hold up to a hearty plate of food). These plates are an obvious choice to serve food from when you've got an informal party. The only downside to these plates are that some people may consider them plain (even the festively colored Party plates) and not as pretty as other disposable plates. Also, they aren't the cheapest disposable plates either (but not even close to the most expensive). For the quality of the plate, it's a good bargain since comparable plates cost the same but do not interlock to form storage containers. Update 2008-05-27 - The Hefty Serve 'n Store product line seems to be discontinued. oh.my.gosh. my hubby, a mechanical engineer, could have written your post. he loves these things and thinks they're the neatest thing to come out in a long time. The FDA does say something. They say it's safe to use containers marked as microwave safe. I touch on this topic briefly in the Bacon Cooking Test (Part I) (yes, yes, Part 2 is coming) and Microwave Safe Containers articles. Cool. I'll try picking these up this weekend for our party. Can you do a write up of Korean BBQ? That's a great suggestion. I had thought of it when we first realized that we didn't know what was in the containers, but never followed up (and forgot to mention it in the article). I'm still in the process of experimenting with a homemade Kal Bi sauce/marinade, but as soon as I'm satisfied with it, I'll post it. I'm a bit worried that you would consider discarding these after a single use ... the manufacturers obviously have an incentive to advise this but it would be a shame to throw away what sounds like a substantial amount of plastic. 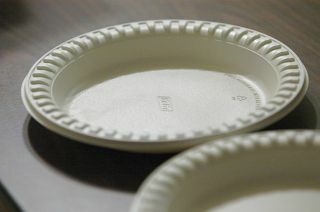 If reused, these would be a great improvement on paper plates and plastic wrap & also on ziplocs. If they ever come out over here (UK) I'd consider buying them, but not if they're not re-usable. Excellent review of the product. Did you try using them in the freezer? I'm thinking since you said they are not water tight that air would also leak in therefore not making them effective in the freezer. What did the manufacturer say about freezing? They work great in the freezer and if they can be microwaved, obviously despite the disclaimers, they can also be washed in the dishwasher. I've been test-washing one plate every day for 2 months with no sign of warping or disintegrating yet. I use mine mostly for food prep and storage and for keeping things warm while cooking. When I do serve food on them, I just put them on top of a clean regular plate for stability and insulation. They are AWESOME! Have you analyzed the rate at which you consume these plates versus your typical disposable plate? Of course there would be waste from whatever you desicde to cover your food with (paper towel, plastic wrap, etc), but these plates seem to be quite a bit more wasteful (could be in my head). Any increase in disposal rate would also increase the real cost of the plates. We use the plates and bowls. They're wonderful. We just toss 'em in the dishwasher. You can also use a plate to cover a bowl of the appropriate size. The Party variant is specifically labeled as NOT microwave safe on the packaging. The everyday version has verbage stating that it IS microwavable molded right into the plates. To me they seem to be different kinds of plastic. We are packing our household to move from San Diego to Tallahassee, FL. These plates and bowls will see us through our last several meals after we finish packing all of our everyday pottery plates and bowls. We are enjoying as much "real" Mexican food as we can, while still in San Diego. We just can't find freshly made tortillas or masa there! And, we will miss TJ's (Trader Joe's) s-o-o-o-o much!!! I'm glad that you wrote the article reviewing them. We don't watch TV and hadn't seen the commercial. ugh ugh - more land fill fodder! The hefty website lists the everyday product as being pp5(polypropylene #5) which falls into the"durable" category of consumer plastics, often microwaveable and dishwasher safe. Caveats include to "avoid using them to heat sugary foods, like syrup or sweetened tomato sauce, which reach very high temperatures and are more likely to melt plastic." 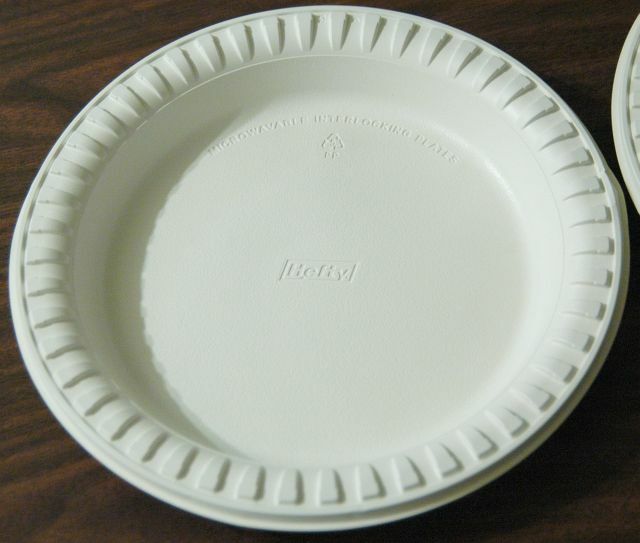 The party plates are ps6 (polystyrene#6), more commonly known as styrofoam,and "are made with benzene and could leech styrene, a possible human carcinogen and hormone disrupter; they also can't be recycled in most communities." People- follow MFG's directions and don't use the colored ones in the microwave! Heck if you can't recycle them and they're not as durable- why use the colored ones at all? Thanks for the great article- I had bought some 2 weeks ago in anticipation of grillilng weather, and appreciate the input! quotes from "plastics unwrappedby Josie Garthwaite, Body & Soul magazine, March 2007, pgs. 64&65. I wash them in the dishwasher and reuse them, but they are no good for storing and transporting wet foods if you have kids or clumsy people in the house. Just wondering if these are recyclable? We need the interlock plates back on the shelves. I have gone to several stores and tried to find them. They are no where to be found. Please help me get these plates back on the shelves. These have been discontinued by the manufacturer. Big Lots closeout store has bought the remaining inventory, so if you have a Big Lots nearby run and stock up while you still can. I love these plates, I cannot find them in Houston, Texas. Does anyone know where I can get them? I've heard reports that they are now discontinued. The Hefty interlocking plates were wonderful and I am unable to find any. These were great for taking meals to senior citizens or people who were recuperating from surgery. I even washed them in the dishwasher when they were returned to me and they worked equally well when reused. I am now down to about 4 plates and would love to find some more. :) I also am unable to find the hefty serve 'n store bowls. I stocked up but am running out of red and green. I use them during the holidays in my work with young children. They give their parents homemade gifts in them. Where can I get more? What do we have to do to get the manufacturers to return these to the marketplace? I have used them happily for years (the same ones since they are dishwasher safe) and now want to buy more for friends to use. Subject: Really missing these plates. I bought several packs a few years ago. We've used them, thrown them in the dishwasher, and reused them over and over. We've given away alot of cookies and other food in these plates. Now I am almost out and bummin' that I can't get more. Only a few have cracked and needed tossed - I guess that's the downfall, they can't sell enough when they last so long. I sent a request on the Hefty web site to please make them again. Maybe if everyone does, they'll make it happen. Not knowing these were discontinued, I gave away my last 2 at Thanksgiving! Doh!!! I am so upset!! Anyone that feels comfortable using the site linked below, could you let us know if this is a viable way to obtain these dishes? They might just list whether an item is in stock after you sign in or something. But, as far as I could tell they don't list them as being out of stock like everywhere else does. I have a set of square plastic containers in varying sizes with clear flat plastic lids that were put out by Hefty Food Containers eons ago but I love them. Does anyone know if these are still made and where I might get them? Subject: Hefty microwave safe interlocking plates ? :( Hefty had a great product here but they evidently stopped producing them. They were made by a company called Pactiv. I sure wish they would put them back in production. I guess we'll have to buy from their competition. It seems that so many times when we find a good product they stop making it ... bummer! bring them back. i purchased three packages in 03/04 and have been microwaving, freezing, refrigerating, and putting them thru the dishwasher for nearly 10 years now. now cannot find any in tn, ga, fl, sc, nc, or ky. been looking for 5-6 years. pls send info to where i can get some now. i'm now down to 4 plates left, because they do eventually tear up. but for 10 years use is a fabulous bargain of every day use. YES!! Please!! If anyone knows where these plates can be purchased, please post!